In 2015, I’ve decided to explore more of Toronto through visiting a park I haven’t been to yet in each of the city’s 44 wards. Toronto is overwhelming large. When I moved here from Vancouver in 2010, I remember going out “exploring” from my apartment in the Annex on my bike or on foot. I would end up in the Junction or at Woodbine Beach and return home thinking I had really seen a lot of Toronto. Then I would look at a map and realize I had barely made a dent. Whenever I travel to a different city, I plot my visit around different parks. It’s my way of exploring a neighbourhood. That and bookstores. As shared public spaces, parks are a great window into a neighbourhood–they seem to absorb the personality of the community around them. And they can also reveal the history of a city in their names and natural environments. 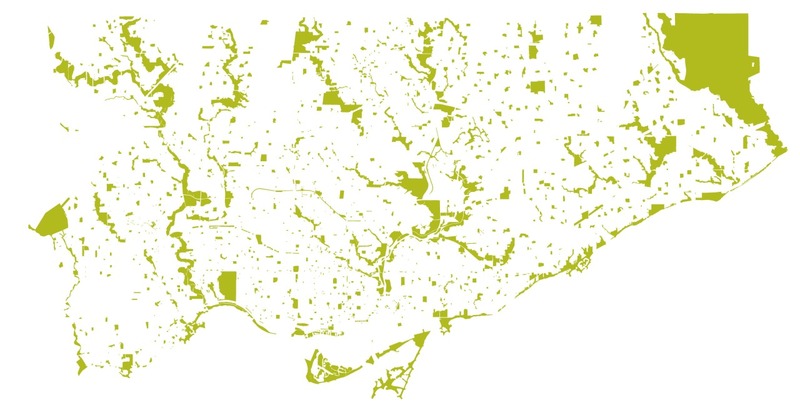 Toronto has over 1,600 parks, covering roughly 13% of the city’s total land area of 630 square kilometres. That’s a lot of parks in a lot of different neighbourhoods in a very, very big city. I’ve been to many parks in all four corners of the city since moving here, but there is still a lot I haven’t seen. It’s easy to get stuck in your own geographic work/home bubble. I live in the Annex and work downtown at Richmond and Spadina, both in Ward 20. I know that there are amazing things happening in parks across Toronto, many done by volunteer-led local park friends groups, and I want to get out and see some of that firsthand. And if anyone has any suggestions of particular parks you love that I should check out, big or small, then let me know: jgarrett(at)parkpeople.ca. You can read the Toronto Star profile here. The map of Toronto’s parks in the title image was made by my colleague Kyle Baptista and you can buy a copy at the Spacing Store at 401 Richmond Street West. When in ward 5, Tom Riley Park has a wide variety of facilities I think that mesh well, for the most part. There’s a lawn bowling club at the head of the park, next to the historical Montgomery Inn with its tinyt farmers market, and a hidden gem of a butterfly garden. Some of the local gardeners do a better job of attracting butterflies than the garden does but its shady and quiet. You can see many bush trails that residents have carved to suit their own purposes, defying the main path and ‘trespassing’ onto the Hydro right of way Northwards to the much larger Lambton Woods park, which has a more accessible connection to the lake along the Humber. The proximity to the local high school means there is ever-changing layer of graffiti on the key concrete structures. Very little of it is visually significant or e rn decipherable, but the copious amounts are impressive. When I first moved here I was surprised how many prolific taggers were apparently lurking amongst the apparently suburbanized, trust-fund crowd at the school. The park’s south-facing potential, however is stunted, as the right-of way along the creek is interrupted by a maze of some of Etobicoke’s finest lushly-forested residential warrens. Getting from here to the lake should be easy along Mimico Creek. It’s anything but. A shame really because at the foot of Mimico Creek is the large Humber Bay park. Anyway hope you get round to seeing us this summer. Love the series, keep it up! Great suggestion. Sounds like a good place to go. Thanks!